When Sgt James Dunnet set out from Thorney Island in September 1940, as navigator to his pilot P/O RV (Herby) Herbert and gunner Sgt WN (Bill, Jock) Young, their task was to ferry a Blenheim IV on the long flight across France direct to Malta in the Mediterranean, then on to Egypt. The Observer’s winged O triumphant, the full ribbon-bar token of much duty carried out. James Dunnet had joined the RAF in January 1939, on direct entry for aircrew as his service number records. By September 1940, he was a Sergeant Observer who had been on operations for about a year. He had seen the sharp end of war, briefly with 85 Squadron Hampdens at RAF Cottesmore in September 1939, later from the right hand seat of the Blenheims of 57 Squadron from May 1940, at Lossiemouth and elsewhere with Herbert and Young. An RAF Cranwell Flight Cadet, on graduation Richard Vivian Herbert 33425 had been granted a permanent commission as Pilot Officer in the regular RAF as of 29 July 1939. He was promoted to Flying Officer with effect from 3 September 1940. Herbert and his two brothers all joined the RAF. None were to survive the war. Their father, Air Commodore PLW Herbert CMG CBE, had qualified as a pilot in 1912 at the age of 30 and was one of the earliest members of the RFC. Posted to France with the first contingent of aircraft and pilots with the BEF in August 1914, Herbert later commanded a range of training postings, in the Middle East up to the end of the Great War, and later in the United Kingdom. Posted to the Air Staff, HQ Fighting Area in 1928, A/C Herbert retired in 1929 and died in 1936. Re-equipped with the Mark IV from March 1940, 57 Squadron had been active in the savagely brief Battle of France that Spring, in the offensive reconnaissance role. With six aircraft destroyed, their losses were somewhat lighter than the carnage suffered by the Battle and Blenheim squadrons attempting to press home day-bombing raids. Herbert and Young were veterans of this period. The Squadron withdrew to Wyton and moved North to Lossiemouth in June. There Herbert, Dunnet and Young survived the 9 July raid on Stavanger in Norway that cost the lives of two crews of 57 Squadron and five of 21 Squadron. Returning across the North Sea on one engine to face an almost disastrous near-miss on landing, the three walked away from the resulting wreckage. What they may have said about the clot in the Anson afterwards remains unrecorded. By coincidence, it was to 57 Squadron that young Mike Grierson was first posted, on joining the RAF in the Cold War years. The Squadron were then flying Handley-Page Victors. Come September 1940 and the Blenheim Squadrons of the Middle East had been operationally busy against the Italians for three months. Against attrition in the desert conditions, aircraft strength had to be maintained and rebuilt—replacements at this early date being delivered by over-flying France, now hostile. So it was that on 24 September, three Blenheim IVs of 57 Squadron set out from Thorney Island, bound in a single stage for Malta and then Egypt. It was 1,280 odd miles to Hal Far, course 138 degrees True. Of that flight of three aircraft, only P/O Herbert, Sgt Dunnet and Sgt Young in Mark IV T2174 arrived safely in Malta, after a flight in extreme weather and of extreme duration for a Blenheim at 8hrs 55min. The loss rate of the ferry flights was high and shortly the route was altered, to stage through Gibraltar before the Malta leg, then on to Egypt and Cairo. By 30 September Herbert, Dunnet and Young had taken their aircraft on to Ismailia, on the Suez Canal. There they parted company with T2174. Shortly thereafter, they were posted as a crew to 211 Squadron, equipped with Blenheim Is and based at Qotaifiya on the Western Desert coast near El Daba. Any Squadron Operations Record Book is something of a patchwork, of work-a-day news, drama, humour, tragedy, sortie details, and the odd blunder; all held together like Bill Baird’s war-time mosquito net—by lots of holes. The arrival of Herbert & Co on 3 October thus goes without remark on the 211 Squadron Form 540 for the month, although P/O Cox’s arrival the next day is noted. On 25 October Herbert, Dunnet and Young took part in their first 211 Squadron raid, one of many against the Italians ranging along the coast, from the front lines dug in around Sidi Barrani, on across the frontier to Gambut, El Adem, or Tobruk in Libya. The next day, the sandstorm at Qotaifiya was so heavy that it brought ground maintenance to a halt for the day. Two days later, on 28 October, the Italians contrived an ultimatum to the Greeks that brought immediate war to the Balkans. 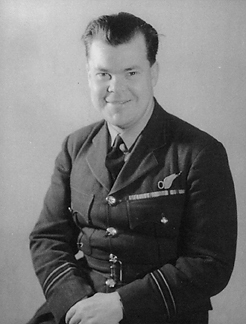 Despite the slight force at his disposal, ACM Longmore at once acted in support, sending the mixed Mark I and Mark IF Blenheims of 30 Squadron. They arrived at Elevsis, some 12 miles to the West of Athens, on 3 November. Three days later, 211 Squadron received orders “to strike camp immediately and to proceed to Ismailia”, where they arrived on 8 November, to briefly re-equip before embarking for Greece aboard HMS Gloucester. Disembarked at Piraeus on 16 November, the Squadron moved to Tatoi (soon to be renamed Menidi) and made ready to receive the Air Party, arriving on 23 November. By 24 November the Squadron was once more operational. They had exchanged the sandstorms of the desert for the rigours of a Greek winter, several raids turning back in bad weather. For a time, the airmen of the Squadron camped out on the floor of the hangar at Menidi, though eventually better quarters were organised. In any event, they little missed the desert sand and flies. For a brief time, they did miss The Bish and his crew, who failed to return from their first raid on Valona. But soon enough, that bluff figure was back with his Squadron, triumphantly brandishing trophies of regard showered on him, Davies and Geary as they returned in fine fettle from their famous forced landing on Corfu, pretty much the last word in stylish late arrivals. Despite the Winter chill, the Christmas of 1940 was a festive one for the 211s. Sgt Dunnet, third from the front, right. 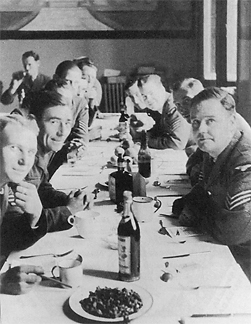 Run off in numbers by the Photo Section bods, the menu was typical of those Service days, decorated with an elaborate seasonally apt border by one of the resident Squadron artists. He may have been an old hand—the corners were arranged to carry a list of all the Squadron’s stations: Mildenhall, Grantham, Helwan, Ramleh, Ismailia, El Daba, Quotafiya and Menidi. The fare was a mix of the austere (the ubiquitous tinned “herrings-in” as entree!) and the festive (with two roasts on offer, plus beer and etceteras). Then, having been suitably fed and watered by The Bish and his officers, belts perhaps eased a little as they leaned back in their chairs, another Mavrodaphne or a glass of Stella and a fag to hand, did they then give cheerful voice to old favourites? Perhaps they did. (to the tune of Everybody's Doing it Now). See all the Blenheims, lined in a row. Chuff, chuff, chuff, and away we go. Two Eleven's shaking 'em, shaking 'em, shaking 'em. Two Eleven's shaking 'em now. On 9 February 1941 the Squadron began its forward move to Paramythia, where conditions suited them rather better for flying operations, albeit in camp under canvas in a mountain valley in Winter. In those Winter weeks, from Menidi and Paramythia between November 1940 and the end of February 1941, the Squadron records accord Herbert, Dunnet and Young a tally of 24 raids against the Italians in Albania. There the detailed Squadron account ends. The operations on Easter Sunday 1941 from Paramythia were recorded in the Squadron account only some weeks later. Among the six crews who did not return from the third operation that day were F/O RV Herby Herbert and F/Sgt WN Jock Young. Also among the missing, Observer F/Sgt Andy Bryce, whose younger brother GR (“Gabe” or “Jock”) Bryce was also serving in the RAF as a pilot. In Athens the end was not far away. Somehow, at the last opportunity, Dunnet himself was able to scramble a lift from Menidi to Crete in a packed Blenheim with nine aboard. After the punishment they had suffered in Greece, in May the Squadron re-established itself in Palestine. Skirmishing over Vichy French Syria briefly, in early June they were stood down from operations, returning via Egypt to start up an OTU for Blenheim crews in The Sudan. About that time, several of the Squadron’s old hands were posted to 11 Squadron—one of them being Sgt Observer James Dunnet. With 57, 211 and 11 Squadrons, Dunnet was to carry out 70 operations in all. Perhaps 40-odd were with 211 Squadron, no mean feat in any theatre. In September 1942, 580695 W/O J Dunnet was made, in the style of the day, Pilot Officer on probation (emergency), rising in January 1943 to Flying Officer on probation (war substantive) with effect from November. In September 1944 came promotion to Flight Lieutenant, with effect from May. At war’s end, there were 89 operations in his Observer’s Flying Log Book, accumulated with four RAF Squadrons (Nos 57, 211, XI and 8). James’ navigating trade had taken him far, and on to the mysteries of radar. In 1948, as the great peace-time RAF shake-out began to settle, the London Gazette caught up with his February 1946 commission as Flying Officer on extended service, for four years on the active list in the Technical Branch (though his promotion to substantive Flight Lieutenant had already taken place). For a time, the RAF continued to tinker with its commissioning policy. James was transferred to the B Class Reserve in 1950 but the Cold War looked set to hot up. He was then appointed to a Short Service Commission in 1951, moving from the Technical Branch to Fighter Control Branch, with 5 more years active service (and four more on reserve) in prospect. During these years he served in staff appointments with Fighter Command and Coastal Command. In October 1952 James was appointed to a Permanent Commission as Flight Lieutenant in Fighter Control Branch, his 1957 Air Force List entry as F/Lt in the General Duties Branch (Ground Section) noting his skill by the brief acronym RS—Radar Supervisor. With it came postings to Germany and the Far East. His retirement came at last in 1966, after 27 years service through war and peace. From 1979, Jock Marshall and Jock Bryce had begun their long search to find and identify the resting places of the missing 211s from the terrible Easter Sunday raid of 1941. It was Marshall’s brief notice about their efforts in the Summer 1982 RAF Association Air Mail issue that caught James’ eye. Sadly, Marshall had died just five weeks before. It was thus that James came to take up the task. Ultimately, with a degree of serendipitous coincidence and the ready assistance of many, their searching bore fruit. Eventually, a number of the missing 211s from that valiant but doomed operation were found, identified, and thus to rest properly at Phaleron (having been previously commemorated among the missing on the Alamein Memorial). It is the history of the Squadron (and of these events in particular) that James’ book Blenheim Over the Balkans aims to record. This wonderful work is straight from the horse's mouth. The opening chapters are taken from James’ own manuscript, first lost in Greece, then partly redrafted, then put aside in Palestine in the inevitable press of war service. Other chapters present contemporary accounts from the diaries and Log Books of 211 Squadron aircrew and groundcrew alike, and war-time correspondence from others uncovered during James’ own continuing search for answers about his friends lost that Spring afternoon in 1941. It is a gripping narrative, rather than a technical work...from the vivid account of the very trying ferry flight to Malta in September 1940, to life on ops in the Desert and then Greece and their off-duty moments, leading to the most detailed account yet of the Easter Sunday raid and its aftermath 40 years and more after. The story appeared in part several times over the years: Flypast November 1983 The Lost Squadron; reprinted in the Blenheim Society Journal No 3 December 1988; summarised in Smith’s Victory of a Sort—The British in Greece 1941-46; and finally, in 2001, publication of Blenheim Over the Balkans. Warmly appreciating James’ own most generous offer to make free use of his material, it has been out of deference to his long labours that this site has, by and large, chosen simply to point to that wonderful book, rather than quoting from it wholesale—with but occasional direct reference for certain very particular points like aircraft identities. James' own long search for the missing 211s of Easter Sunday; his book in manuscript itself; his work with Ian Carter in getting the book published for the 60th anniversary of Easter Sunday in 2001; Ian’s effort in rescuing the stock from the wreck of Pentland not long after (arranging sale through the now retired Frank Smith Books and by the Blenheim Society)—all these were very considerable achievements. A decade on, and of the original 870-odd print run some 200 copies are yet available for purchase, through the Blenheim Society. And in select libraries of the UK and Australia, reference copies lie safe for future research. Along the green slopes below the ancient ruins of Castle Deganwy, above the ageless River Conway, the neat houses of Llanrhos look out by turns over golf-course, beach, marina and glinting Irish Sea, and on to pretty Llandudno. There in “the tranquillity of retirement”, James Dunnet and his wife Heléne made their home. James and I were in touch from 2001 at least, exchanging cordial cards and letters along the way. Among the 211 Squadron treasures I prize most are his kindly words on the occasion of my father’s death in 2003; the beautiful certificate he and Bill Baird both signed in small numbers to help Blenheim Society fund-raising; and most recently, a copy of Blenheim Over the Balkans that he especially inscribed for my son and I. Writing to me in October 2003, it was James who, thinking of those glorious, wild, desperate days in Greece 70 years ago, called to mind some lines which in part provide an envoi to the Final Farewells roll. Heléne passed away in 2010. James, last of the Squadron’s Blenheim aircrew, died in the small hours of 3 March 2013. It has been both a pleasure and an honour to know such a man. Clark CFR & Clark DR 211 Squadron RAF, Greece, 1940—1941: An Observer's Notes and Recollections (Canberra 1998).